Concussion spotters can call a medical timeout if a player exhibits symptoms but hasn’t had a chance to be evaluated by team doctors. 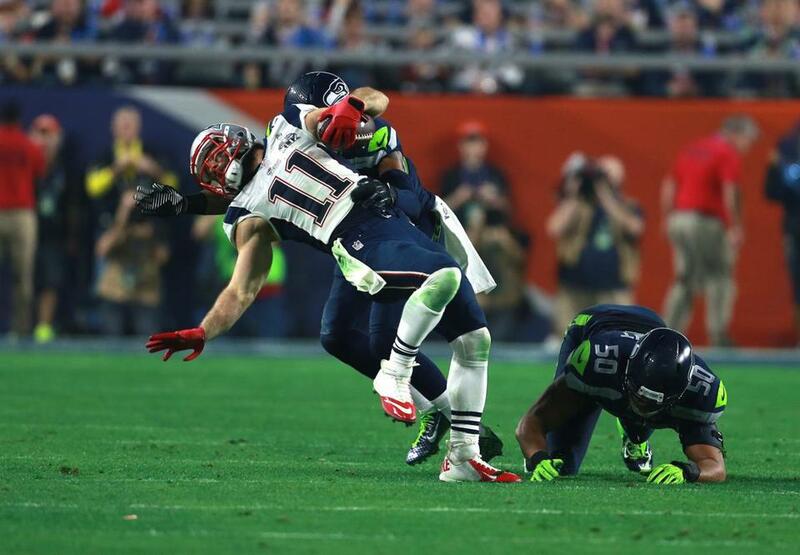 Julian Edelman didn&apos;t come off the field until several plays after absorbing a head-to-head hit from Kam Chancellor in the third quarter of the Super Bowl. The NFL’s ball-inflation procedures were strengthened for the 2015 season because of the Patriots. The eligible-ineligible tactics were mostly outlawed because of the Patriots, and the extra point was pushed back to the 15-yard line at the prodding of the Patriots. 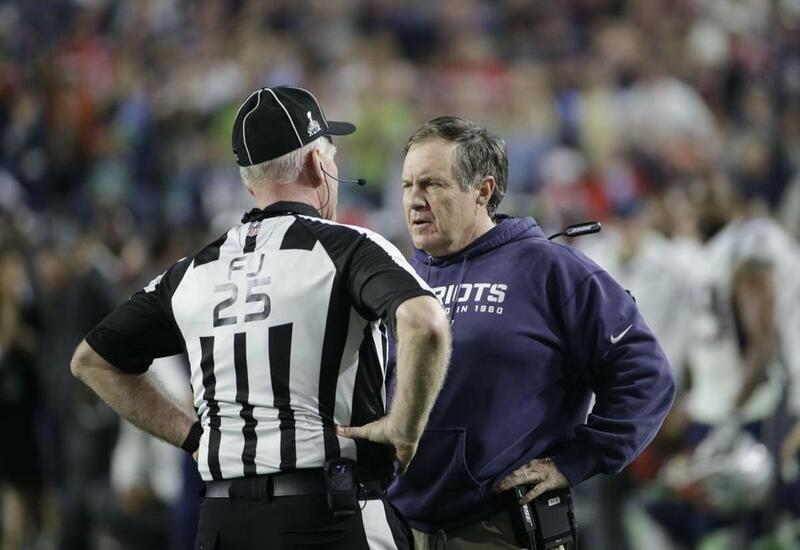 And the Patriots are at least partly responsible for a fourth rule change for 2015 — the “Julian Edelman Rule,” as it were, that will allow the concussion spotters to signal down to the officials on the field and call a medical timeout if a player is exhibiting concussive symptoms but hasn’t had a chance to be evaluated by team doctors. Edelman appeared woozy after taking a hit from Seahawks safety Kam Chancellor with about 11 minutes left in the fourth quarter of the Patriots’ Super Bowl win. Reporters overheard the concussion spotter radioing down to the Patriots’ sideline that Edelman needed attention, but the Patriots were running a hurry-up offense, and Edelman didn’t come off the field until the end of the drive several minutes later. Edelman subsequently passed his concussion tests on the sideline. But the concussion spotter has a lot more power this season, with the ability to stop the game himself. The player will be forced to sit out at least one play and cannot return until he passes the concussion tests. Neither team will be charged a timeout and the play clock will be turned off during a medical timeout. The system won’t be perfect. The concussion spotter could potentially misconstrue an injury and unnecessarily stop the game. Or, more likely, the concussion spotter will mess with the tempo and rhythm of a hurry-up offense, which could be particularly tricky for a team such as the Patriots, who like to mix the tempo often. But for the NFL, those concerns are greatly overshadowed by the need to diagnose and treat concussions properly. The Edelman play was just one of several that convinced the league to make the change. Seahawks quarterback Russell Wilson also potentially played through a concussion in last year’s NFC Championship game. The NFL is believed to be the first league to allow its medical personnel to stop game play, and the new rules will be in place for the first time this week for the first round of exhibition games. All spotters must have current certification by the National Athletic Trainers’ Association, have a minimum 10 years of experience as an athletic trainer, have major college and/or professional sports experience, never have been employed as a head athletic trainer by an NFL team, and have not been employed by an NFL team in the past 20 years. The NFL will employ approximately 64 spotters and rotate them to different games. “We wanted to make sure there weren’t any potential conflicts, now that they’re more like an official,” Miller said. Though stoppages could bother coaches, players, and fans alike, it is another step toward protecting players. Coaches, players, and fans might get annoyed with a game stoppage in the middle of an important or fast-paced drive, but this is a needed step in the evolution of protecting players, particularly given the proliferation of up-tempo offenses. Miller stressed that the NFL doesn’t anticipate concussion spotters having to stop games too often, given the number of medical personnel watching from the sideline. But having an extra set of eyes in the press box is crucial and can fill in any gaps. “The expectation is not that this is a frequent occurrence, because there are so many other people who can also identify the injury,” Miller said. And while longtime fans may complain about the new player-safety rules that have taken a lot of the physicality out of the game, the NFL claims that in-game concussions are down 35 percent since 2012, the first year the league instituted concussion spotters. Roger Goodell has only further proven that he doesn’t deserve the power he has. The next labor negotiations between the NFL and the NFL Players Association aren’t until the spring of 2021, but we won’t have to guess what one of the union’s main sticking points will be. In the last negotiations in 2011, it was player safety — strict limits on practice time and full contact, as well as better post-retirement benefits. Next time it’s going to be Article 46, or the powers granted to the commissioner regarding player discipline. The treatment of Tom Brady and the entire Deflategate saga has been the tipping point for the players, who are fed up with Roger Goodell blatantly disregarding the rules laid out in the collective bargaining agreement. The players have now had to take legal action three times in the last year to prevent Goodell from abusing his powers — Ray Rice, Adrian Peterson, and Brady. The players also took action against Goodell for his player suspensions in the Saints’ Bountygate scandal, and came out victorious. 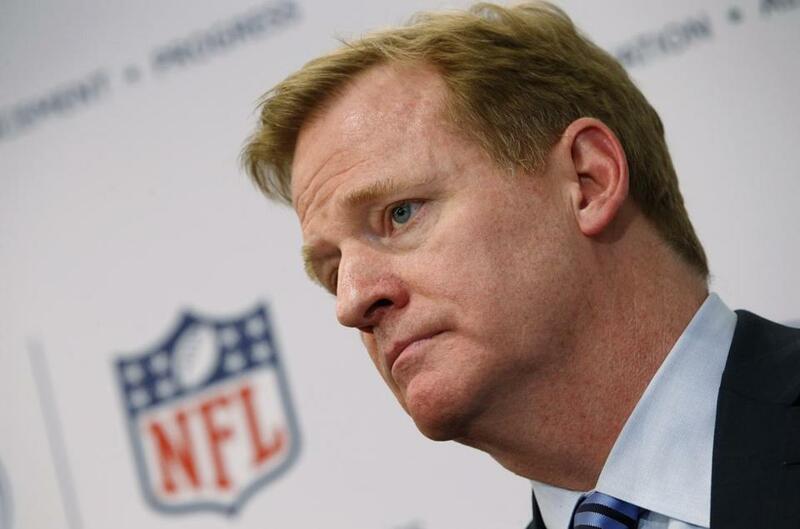 It’s one thing for Goodell to get tough on players accused of domestic violence and drunken driving. But when he brings the hammer down on Brady for a minor infraction and justifies his punishment with a sham of an investigation and appeals process, Goodell only further proves that he doesn’t deserve the power he has. The commissioner’s power to be the arbiter of appeals has been in place since the league’s first CBA in 1968, but Goodell is the first commissioner to consistently test the boundaries. The NFL’s constant court battles aren’t good for the overall health of the sport. It will be interesting to see how someone like Robert Kraft handles this at the next CBA negotiations. Kraft was all in favor of Goodell having total power until it worked against him in Deflategate. The owners naturally oppose any proposals made by the union, but I think now they’re starting to see the downside of Goodell’s reign of terror. 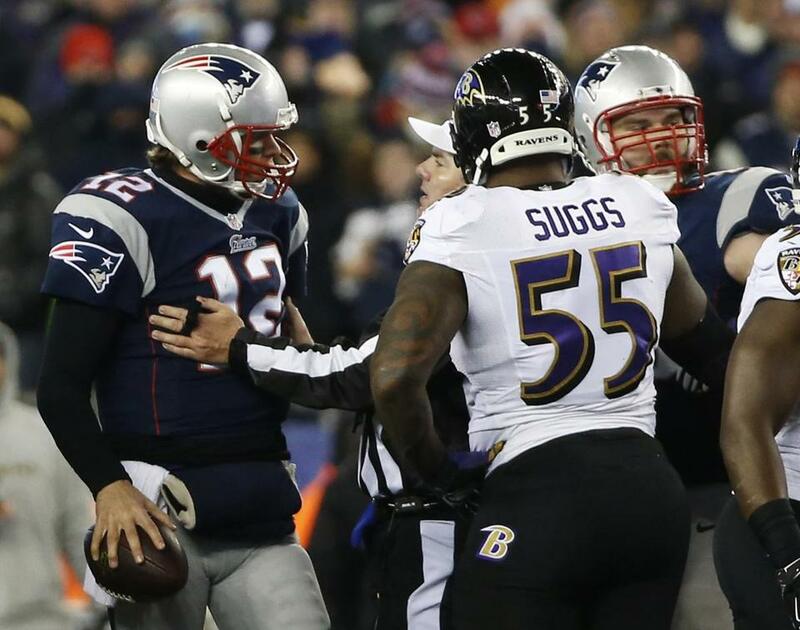 Terrell Suggs defended Tom Brady back in June. First, it was Ravens pass rusher Terrell Suggs, who usually avoids saying Brady’s name in interviews, defending Brady’s legacy in June. Then last week, it was Jets cornerback Antonio Cromartie rushing to Brady’s defense. “In the rulebook, there’s no suspension in the rules. There’s only a $25,000 fine,” Cromartie said of the punishment handed down to Brady. “So I don’t see how you can try to lay the hammer down on someone when the rule states for itself there’s no suspension for it. There’s only a maximum fine for $25,000. What’s interesting is that most neutral observers appear to be siding with Brady over Goodell in this mess, thanks largely to the appeal hearing testimony that was unsealed last week, revealing that Goodell took Brady’s testimony out of context to fit the league’s narrative that Brady and the Patriots were cheating. 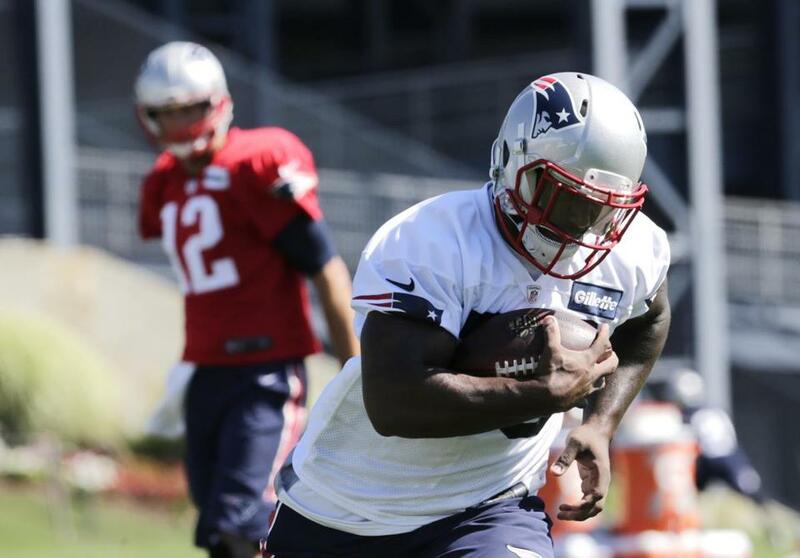 Jonas Gray has looked powerful and swift during training camp. ■ Bill Belichick has an interesting dilemma in terms of player management. He noted on SiriusXM last week that he has 21 rookies or thereabout (the bottom of the roster is fluid), meaning a lot of players who need the reps. But the Patriots also are a veteran-laden team that needs to worry about getting ready for Week 1 instead of going full speed ahead every day in camp — which was reflected on Friday, when 21 players sat out practice nursing injuries. Belichick has to find the right balance of getting his players enough reps to get them ready for the regular season, but not so much that he wears them out before the season even begins. ■ The most interesting position battle is at running back, where it’s easy to make a case for all seven on the roster, but realistically only four or five will stick. LeGarrette Blount appeared to have the leg up to be the primary running back, but after coming to camp out of shape, failing his conditioning test, and then suffering an injury on Friday, he hasn’t exactly impressed the coaching staff. Jonas Gray, meanwhile, has looked powerful and swift, dropping 10 pounds to 225. And the battle for the “Shane Vereen role” has been very tense — James White is the presumed favorite as last year’s fourth-round pick, but Travaris Cadet has been by far the most dynamic runner so far, and one of Dion Lewis’s bosses on a previous team is convinced he’s going to have a big role for the Patriots, who apparently beat out several teams for Lewis’s services. An unfortunate side effect of the NFLPA’s lawsuit against the NFL was that Tom Brady’s e-mails got entered into public record by his attorneys. It couldn’t have been too fun for Brady to have some of his private business put into the open, but one e-mail in particular offered a fascinating window into Brady’s frame of mind — a window he hasn’t opened much for the public in his 15 years as a superstar quarterback. 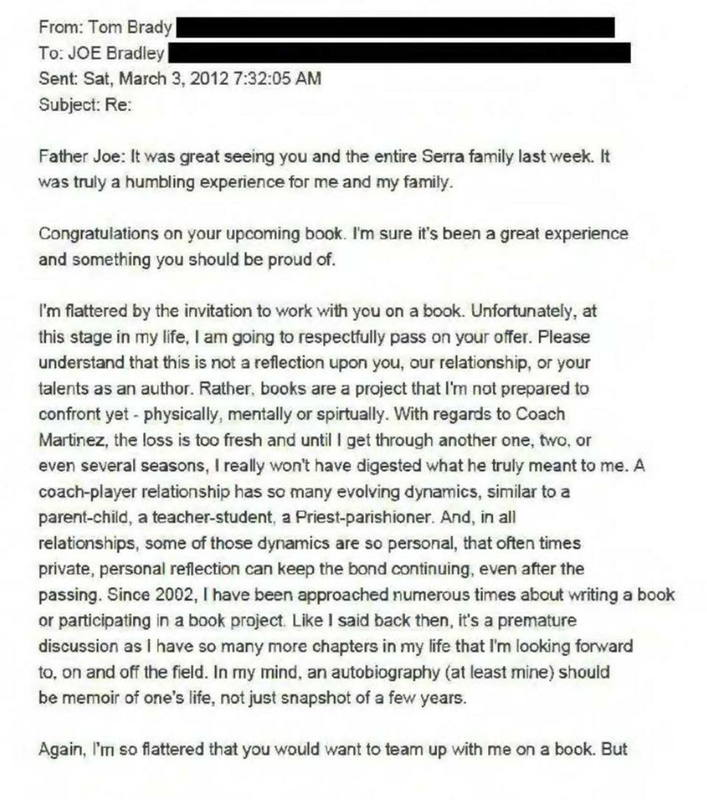 The e-mail from 2012 was sent to Father Joe, the priest at Brady’s old high school (Junipero Serra in San Mateo, Calif.) who asked Brady if he wanted to partner up on a book that would be framed around Brady’s relationship with Tom Martinez, his longtime quarterback coach who died in 2012. Brady’s answer was deep and profound. The NFL is partnering with the Canadian Football League this fall to implement and monitor a new concussion test, the King-Devick Test, which is based on eye movement and will be utilized in CFL games. The NFL will contribute funding and help monitor results to help determine if the K-D Test improves the ability to diagnose concussions. D'Brickashaw Ferguson (60) has played every offensive snap since getting drafted in 2006. 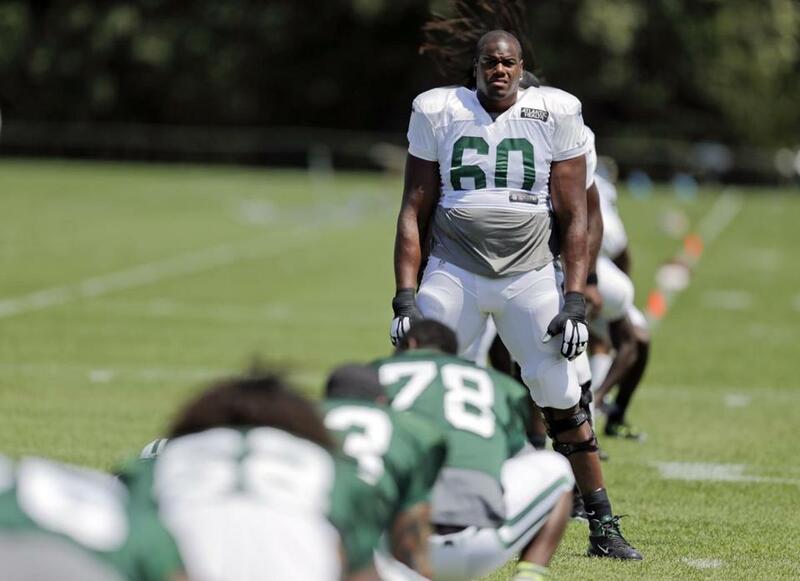 Great stat in the New York Daily News last week: The Jets have had 10,196 offensive snaps since left tackle D’Brickashaw Ferguson was drafted in the first round in 2006, and Ferguson has played in every one. Now, if only he could play quarterback . . . Aldon Smith to the Cowboys in 3, 2, 1 . . . The NFL has to be nervous about this year’s Super Bowl at the 49ers’ Levi’s Stadium, as the condition of the turf has been a mess since the stadium opened last year, due in part to California’s historic drought. It’s only August and a game hasn’t been played there this season, yet the 49ers had to cancel a practice scheduled for Sunday at Levi’s because the turf is in poor condition. “We remain confident that our turf management program will provide a playing surface that meets the team’s standards, as we enter the 2015 NFL season,” vice president of stadium operations JimMercurio said. When Ken Stabler died in early July, calls were renewed for him to be enshrined in the Pro Football Hall of Fame. The iconic Raiders quarterback was NFL MVP in 1974, was named to the 1970s All-Decade team, and authored some of the most memorable moments in football history (Sea of Hands, Ghost to the Post, Holy Roller). Can you match these Hall of Fame quarterbacks of Stabler’s era with the statistics below? Ben Volin can be reached at ben.volin@globe.com. Follow him on Twitter @Ben Volin. Material from interviews, wire services, other beat writers, and league and team sources was used in this report.